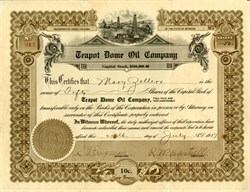 Beautiful certificate from the Teapot Dome Oil Company issued in 1817. This historic document has an ornate border around it with a vignette of oil fields. This item has the signatures of the Company's officers. This is the first time we have seen a certificate from this company. treas; Paul B. Gaylord, vice-pres. ; D. H. Staley, secy: R. W. Hartsell, busness mgr. Holds leases on 1,120 acres in Teapot Dome, twps. 38 and 39, ranges 78 and 79. Natrona County. The Teapot Dome scandal was a bribery incident that took place in the United States from 1921 to 1922, during the administration of President Warren G. Harding. Secretary of the Interior Albert Bacon Fall had leased Navy petroleum reserves at Teapot Dome in Wyoming and two other locations in California to private oil companies at low rates without competitive bidding. In 1922 and 1923, the leases became the subject of a sensational investigation by Senator Thomas J. Walsh. Fall was later convicted of accepting bribes from the oil companies and became the first Cabinet member to go to prison. No person was ever convicted of paying a bribe, however. Before the Watergate scandal, Teapot Dome was regarded as the "greatest and most sensational scandal in the history of American politics". The scandal damaged the public reputation of the Harding administration, which was already severely diminished by its poor handling of the Great Railroad Strike of 1922 and the President's veto of the Bonus Bill in 1922. In the early 20th century, the U.S. Navy largely converted from coal to oil fuel. To ensure the Navy would always have enough fuel available, several oil-producing areas were designated as Naval Oil Reserves by President Taft. In 1921, President Harding issued an executive order that transferred control of Teapot Dome Oil Field in Natrona County, Wyoming, and the Elk Hills and Buena Vista Oil Fields in Kern County, California from the Navy Department to the Department of the Interior. This was not implemented until 1922, when Interior Secretary Fall persuaded Navy Secretary Edwin C. Denby to transfer control. Later in 1922, Albert Fall leased the oil production rights at Teapot Dome to Harry F. Sinclair of Mammoth Oil, a subsidiary of Sinclair Oil Corporation. He also leased the Elk Hills reserve to Edward L. Doheny of Pan American Petroleum and Transport Company. Both leases were issued without competitive bidding. This manner of leasing was legal under the Mineral Leasing Act of 1920. The lease terms were very favorable to the oil companies, which secretly made Fall a rich man. Fall had received a no-interest loan from Doheny of $100,000 (about $1.32 million today) in November 1921. He received other gifts from Doheny and Sinclair totaling about $404,000 (about $5.34 million today). It was this money changing hands that was illegal, not the leases. Fall attempted to keep his actions secret, but the sudden improvement in his standard of living was suspect. In April 1922, a Wyoming oil operator wrote to Senator John B. Kendrick, angered that Sinclair had been given a contract to the lands in a secret deal. Kendrick did not respond, but two days later on April 15, he introduced a resolution calling for an investigation of the deal. Republican Senator Robert M. La Follette, Sr. of Wisconsin led an investigation by the Senate Committee on Public Lands. At first, La Follette believed Fall was innocent. However, his suspicions deepened after his own office in the Senate Office Building was ransacked. Democrat Thomas J. Walsh of Montana, the most junior minority member, led a lengthy inquiry. For two years, Walsh pushed forward while Fall stepped backward, covering his tracks as he went. No evidence of wrongdoing was initially uncovered as the leases were legal enough, but records kept disappearing mysteriously. Fall had made the leases appear legitimate, but his acceptance of the money was his undoing. By 1924, the remaining unanswered question was how Fall had become so rich so quickly and easily. Money from the bribes had gone to Fall's cattle ranch and investments in his business. Finally, as the investigation was winding down with Fall apparently innocent, Walsh uncovered a piece of evidence Fall had forgotten to cover up: Doheny's $100,000 loan to Fall. This discovery broke the scandal open. Civil and criminal suits related to the scandal continued throughout the 1920s. In 1927 the Supreme Court ruled that the oil leases had been corruptly (fraudulently) obtained. The Court invalidated the Elk Hills lease in February 1927 and the Teapot Dome lease in October. Both reserves were returned to the Navy. In 1929, Albert Fall was found guilty of accepting bribes from Doheny. Conversely, in 1930, Edward L. Doheny was acquitted of paying bribes to Fall. Further, Doheny's corporation foreclosed on Fall's home in Tularosa Basin, New Mexico, because of "unpaid loans" which turned out to be that same $100,000 bribe. Sinclair served six months in jail on a charge of jury tampering. Another significant outcome was the Supreme Court's ruling in McGrain v. Daugherty (1927) which, for the first time, explicitly established that Congress had the power to compel testimony. In February 2015, the Department of Energy sold the oil field for $45 million to Stranded Oil Resources Corp. after extracting 22 million barrels of oil over the years. Teapot Dome is an historic site of national significance over which developed a scandal of national proportions, involving California as well as Wyoming oil fields and involving high officials of the United States government and private enterprise. However, the dome itself is less visible than the rock for which it was named. Therefore, the nomination to the National Register of Historic Places pertains to the rock which is a visible symbol or reminder of that famous American scandal. Teapot Rock is an eroded sandstone formation located about 25 miles north of the city of Casper in the southwestern Powder River Basin. The formation which once looked like a teapot has given its name to a number of natural and man-made features of the surrounding landscape including a creek, townsite, oil development company, and one of the most famous oil fields in American history. About six miles east of the rock is the southern boundary of the Teapot Dome Naval Oil Reserve; 9,481 acres of land set aside in 1915 by presidential executive order as United States Naval Oil Reserve Number Three.